Unnayan Sangha (US) is a non-government, non-profitable and non-political organization established in 1980 by some of the enthusiastic and benevolent persons of Jamalpur and Sherpur district with a view to help poor people of the area. For running the organization smoothly two different committees are functioning well. The general committee of the organization consisted of 21 members in whom 8 are female and in the executive committee 3 are female out of 7 members. The head office of the organization is situated in Jamalpur District town. It has been working within the 12 Upazilas of Jamalpur and Sherpur District. 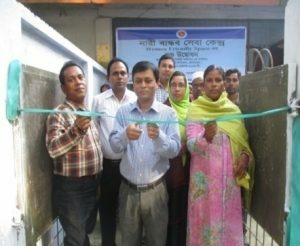 The working area has been expanded in other 5 districts in greater Mymensingh and Sirajgonj to work for the “Children in Jail”. The Vision of the organization is “The vision of the organization is “A society, based on equality, fairness and good governance, which can ensure sustainable development and people’s empowerment” and the mission is “to organize more exploited people for their socio-economic development implementing different development activities. Unnayan Sangha works in two different approach like- group based development and community-based development. The activities of Unnayan Sangha are- a) Savinds Management Program, b) Maternal Neonatal and Child Survival (MNCS), c) Chars Livelihoods Program (CLP)-2, d) Strengthening Household Abilities to Respond to Development Opportunities (SHOUHARDO) II Program, e) Child protection: Juvenile Justice Program (JJP), f) Human rights, g) Environmental sanitation, Digester management and climate change mitigation h) Training, i) Good governance, j) Bangladesh Local Procurement Pilot (BLPP) project, k) Maternal Neonatal Health (MNH) initiative, l) Maternal Young Child Nutrition Security Initiative (MYCNSI) and m) Children and Women Rights and Advocacy (CWRA). .
To improve the status of agriculture sector and observing the situation of agricultural sectors, loan realization and use of credit money, presently US provided cropping loan for the poor and marginal farmers in simple and relaxed pay back system. It helped them to cultivate crops and to get expected benefits. The loan also given for maize culture and that helped for the sustainable development in agriculture. For the well implementation of the development activities and for ensuring good governance and human rights especially children and women rights, the organization has gained a good partnership and networking with different national and international organization including donors, like- UKAid, DFID, USAID, AUSAid, Chemoncs International Inc., Unicef Bangladesh, Manusher Janno Foundation, UCEP bangladesh etc. We welcome suggestions, recommendations from any of the individuals or organizations for the overall development of Unnayan Sangha.